The way we communicate with others has undergone tremendous change over the years. Since simply calling in our friends and hearing their voices is too traditional, folks have started to prefer texting to receiving or making a call – reason being you can be true to your own self while texting as you don’t need to devise false expressions. Now, to make texting more effective than it was ever before, Argentine Industrial design student and 3D artist, Guillermo Callau has come up with a mobile, versatile texting device that, aside from helping users in writing and receiving short messages, enables them to transfer thumbnail images too. Dubbed as Textube, the communication device allows users to do texting and social networking in chorus. 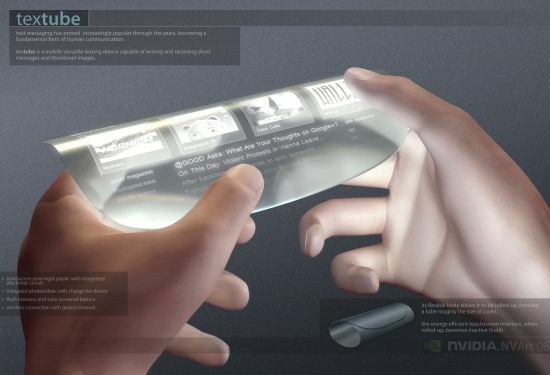 The texting concept device flaunts a transparent semi-rigid plastic frame with incorporated electronic circuit. The flexible gadget relies on integrated photovoltaic cells for meeting its power-related requirements. A solar powered battery is there to store the charge. Textube can be wirelessly connected to available networks for speedy execution of functions. Textube looks like a pen-sized tube when rolled up. If you want this gadget to serve you for long hours, what you need to do is roll it up. By doing so, the device becomes inactive and saves a lot of power for later use.